There are different approach when it comes to maintaining good oral health, scaling and root planing are one of them. The procedure might not be as popular as the other dental practices; however, it is one effective way to clean the teeth and gums thoroughly. At The Holistic Dental Center, we offer Scaling & Root Planing as part of our Preventive Care services. Scaling and root planing also referred to as deep oral cleaning are ideal for those who experience gum inflammation due to plaque build-up as well as gum disease. The treatment help patients in avoiding the adverse effects of the periodontal disease by getting rid of the harmful bacteria in the mouth that has gained access on the gum line. How do scaling and root planing differ? Scaling focuses on removing tartar on the surface of the tooth as well as below the gum line, while root planing eliminates the infected tooth structure and smoothens the root surface to promote gum reattachment. Will anesthesia be needed for the procedure? Scaling and root planing is a non-surgical procedure and requires no anesthesia at all. The procedure causes minimal discomfort, however, for those who have high levels of sensitivity, local anesthesia can be used to guarantee complete comfort. What are the tools used for scaling? There are two types of dental instrument used by the dental professional or dental hygienist. Some prefer to use a dental scaler and curette to remove the plaque from the teeth manually. The dentist will examine the teeth’s surface; the rough spots will serve as an indication of tartar build-up. Other dentists use ultrasonic scaling instruments which has a vibrating metal tip that also eliminates tartar. After the scaling and planing, the gums will feel numb and slightly tender due to the administered local anesthesia. Maintaining proper oral hygiene can ensure the restoration of the patient’s healthy and firm gums. How to perform scaling and root planing aftercare? To properly maintain the newly cleaned gums certain aftercare techniques must be followed. When brushing the teeth, use a soft-bristled toothbrush and a mild fluoridated toothpaste to avoid irritations. To soothe the gums, rinse the mouth with a glass of salt water. Avoid eating hard or crunchy foods for at least three weeks after the treatment. As much as possible, eat only soft and easy to chew foods for better healing. 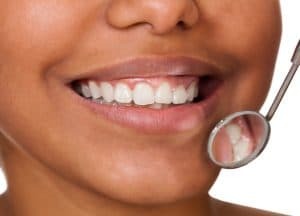 To get the maximum result of scaling and root planing good oral care at home must be adequately observed to be followed by a regular visit to the dentist. Sometimes, the dentist will require a revisit to monitor the depth of the gum pockets. For more information about Scaling & Root Planing under Preventive Care services in Spokane, WA, be sure to contact The Holistic Dental Center today. Our entire team looks forward to meeting you in person and helping you achieve the best possible dental health results. Visit us at 731 W. Indiana Avenue, Spokane WA 99205 to get started on your new smile!